From panda cubs to political scandals, last week was full of big headlines, but The Grey Lady had an above-the-fold story of its own. The New York Times debuted a sleeker, simplified site with updated features that highlight new capabilities for storytelling and journalism in the digital age. One of our favorite new features? Condensing the “TLDR”-inducing multi-page stories into a single scroll. Not only does it look better, it’s also far less disruptive to the reader and provides the perfect excuse to keep reading instead of finding a good stopping point and finishing the story over lunch. We’re going show our nerd card here, but we’re super curious to see if this new feature increases the time people spend on the site. Another swoon-worthy feature is the new focus on photojournalism. Photos can be clicked on and expanded within the current window so you don’t have to leave the story. The pics are grand and gorgeous – NYTimes has never had an issue getting award-winning photogs, but the new format shows off their work in ways the old site never really could. Other improvements include easier ways to share the content, breaking news alerts that pop up on the top of the page, and smoother transitions to the next stories. 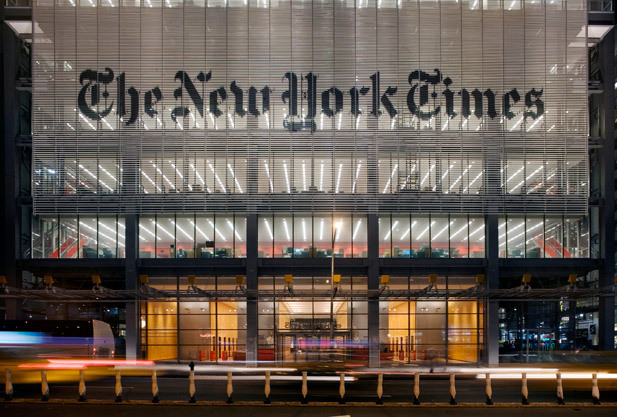 Like journalism itself, NYTimes has constantly evolved. Since launching an online edition in 1996, we’ve been able to witness its many transformations (click here to see a slideshow of the different versions). To sum it all up, we think what we’re seeing here are trends that will dominate web design in 2014: classic, clean, and visual. What are your thoughts on the updated site? Love it? Hate it? Still relish the ink stains on your hands from the paper edition? Let us know! Tagged media, new york times makeover, new york times redesign, newspapers, the grey lady, the new york times.